I’ve had one hell of a week!! We nearly had to give up our ice cream van Lulu, I’ve been getting over a virus and then I had 2 wisdom teeth out!! I suppose you could say it couldn’t get any worse!! It doesn’t help that this has come on the heels of a fantastic week where I met my new nephew and spent time with my mum!! So I guess you could say I’m in need of comfort food. Now this means different things to different people, but for me it needs to be filling, tasty and above all easy to make, and that means mash!! Whether its mashed potato, carrot & swede or celeriac, it’s that smooth, buttery, satisfying sensation that forms the basis of so many dishes I associate with good times. In the interest of full disclosure I have to admit that until recently my mash wasn’t perfect!! I suppose it’s such an easy dish that I kinda assumed it wasn’t something that I needed to learn how to make, and that meant that usually, although tasty, my mash wasn’t Flabulous!! All that has now changed thanks to Delia Smith and my trusty stick blender attachment kit!! Now I serve up smooth, silky, divine mash every time and the Dazzler loves me for it!! It’s so simple and I was so close before that I couldn’t believe how easy it was to get right. Drain & leave in the pan with a tea-towel over & the lid on for at least 10 minutes. This will allow them to dry out & develop a white powdery coating. 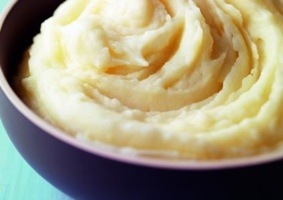 Using a hand mixer (the type with 2 whisks) on full setting blitz the potatoes until creamy and gorgeous!! But it doesn’t end there!! Now you have the basis of sooo many Flabulous dishes….